US President Donald Trump did not attend a summit on climate change in Paris on Tuesday, but he's got big plans beyond planet Earth. He wants to send American astronauts back to the moon, and to places no man has ever gone before. Signing his administration’s first space policy directive on Monday (Dec. 11), Trump said it would order NASA to refocus on human exploration and discovery, 45 years after its last Apollo mission to the moon. Trump said the initiative would create many jobs and he hoped to see a lunar mission serve as a stepping stone to Mars. "This time, we will not only plant our flag and leave our footprint, we will establish a foundation for an eventual mission to Mars - and perhaps, someday, to many worlds beyond," Trump said. "This directive will ensure America's space program once again leads and inspires all of humanity." The signing ceremony included former lunar astronauts Buzz Aldrin and Harrison Schmitt, as well as Peggy Whitson, whose 665 days in orbit is more time in space than any other American and any other woman worldwide. Trump’s announcement comes just as China is working on its own ambitious lunar program. Back in June, China's space official said the country was making “preliminary” preparations to send a man to the moon. "We are the leader and we're going to stay the leader,” Trump said. "And space has so much to do with so many other applications, including a military application," he added, without elaborating. 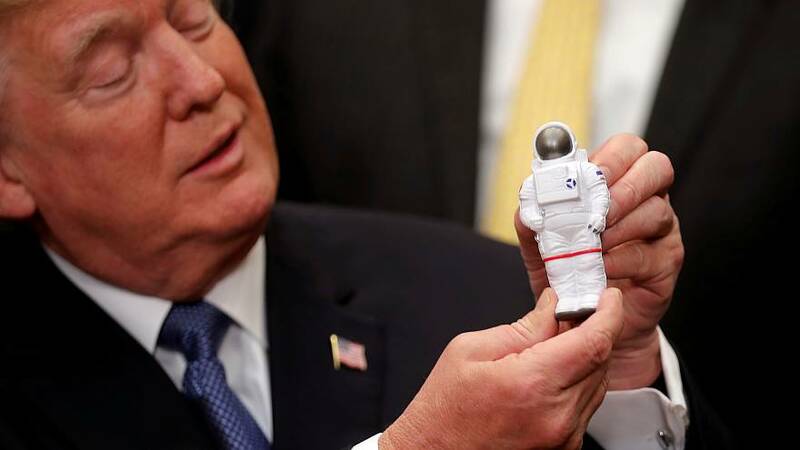 Little detail was given of Trump’s plans, but many on social media were quick to deride it - with some quipping that if America is going to lead in space, then why not send Trump there first?